Hellllooo Detroiters, PPPers, and those of you who think Tom Brady and the Patriots need to bring in Olivia Popeto deal with Deflate-Gate. It's not whether or not you cheat. It's whether you cheat and it can't be fixed by a fixer. Prioritize the Outcomes You Seek. Do you want Measles, Mumps or Impact? Considering the outbreak, that was an unfortunate choice of dress, Minnie. No, those are not freckles. A little bit to you, and to you, and to you!! This "Measles" approach surely doesn't lead to sustainable impact or catalytic change. Conversely, many urban revitalization investments often reflect a "Mumps" approach: A disproportionately large investment is made in one large-scale project, with the hope that it will spark change throughout the city, or "trickle-down" to other neighborhoods. No, that's not chewing tobacco: 12 NHL Hockey players and referees contracted the mumps late in 2014. This "Mumps" approach has the same "M.O. ": Each deal is an expensive, one-off, custom-tailored suit. It won't fit any other neighborhood. And it won't work in the next market cycle. The "Mumps" approach is not limited to real estate deals, but can also be found in infrastructure projects and government subsidies of company relocations. Most city-funded sports stadiums are "Mumps" deals that tend to be bad or mediocre investments for the city in the long term. So, how do you maximize your ROI on neighborhood investments? How do you create replicable and scalable impact through strategic investments in neighborhoods? Use Data to Inform Decisions. You would be surprised how many philanthropic and government investments in neighborhoods are made without the benefit of defensible data. Neighborhoods are targeted without a quantitative basis for choosing that neighborhood. Certain types of neighborhood investments (e.g. facade programs) are prioritized without clear data that they catalyze change. Invest in compiling clean and current data, analyze the data for patterns and associations, and do your market and feasibility homework. After that work is finished, invest based on what you learn. Do this right and you are more likely to end up with replicable projects. 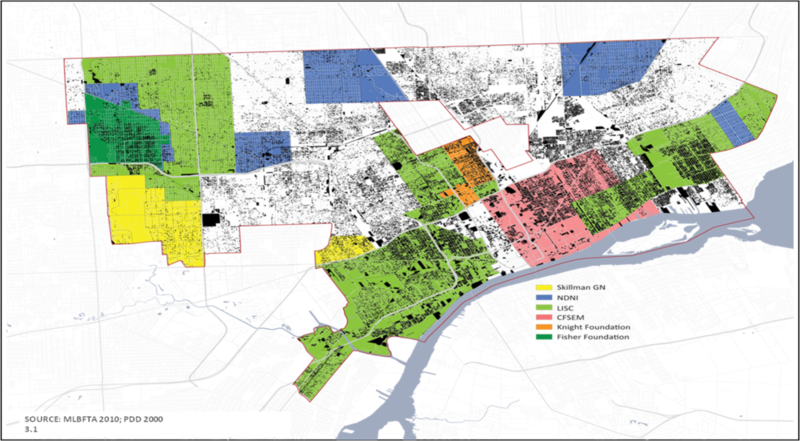 A great example of a data-driven approach is the City of Detroit's fight against blight through the data collection, cleaning and analysis efforts of the Motor-City Mapping project led by Data Driven Detroit and Loveland Technologies. Prioritize the Outcomes You Seek. Is your #1 goal to improve the housing stock in the neighborhood? If yes, what kind of housing? Affordable? Market-rate? Mixed-Income? Mixed-Use? Rental or home-ownership? Single or multi-family? Or is your priority supporting local small businesses and neighborhood supporting retail? Or are you trying to improve the quality of life in the neighborhood through open space and infrastructure investments? If you look at the resources you've allocated to a neighborhood and your top priorities are not clear, you are almost certainly going to have a limited return on those investments. Synchronize Your Investments. Make sure that your investments follow or correlate with other investments in the same geography. Are there local organizations on the ground making similar or complementary investments? If you're a city with limited resources (don't you all have limited resources? ), strive to invest where there are also philanthropic, non-profit and private sector investment and resources being deployed. The same rule applies to philanthropic and non-profit organizations -- just because you're mission-driven doesn't mean you need to be an "island of investment" floating by yourself with no partners and no cavalry in sight. You cannot have the impact you seek if you are the only source of positive activity in a neighborhood! Make sure your investments flow to places where there are community leaders and local organizations that will help make your investments catalytic, rather than just cathartic for your glossy annual report. Use Data. Have Priorities. Synchronize Investments. That's the way you maximize the ROI on your neighborhood investments. Posted on January 31, 2015 by Mosaic Urban Partners.